The thing about acquiring a kilt–as I did on Sunday–is that along with it you get an entire set of new sartorial concerns. Kilts are normally worn with a sporran, special socks, garters, jacket, and ghillie brogues. Plus probably more than that, for all I know. But since my kilt is the decidedly nontraditional leather, I’ve already taken it out of consideration for formal occasions, like, say Scottish Prom. So I’ve got a little more freedom in crafting the complete outfit as I see fit. After getting some inspiration from a Google image search and incorporating my own style, I think I have an answer. What to wear with my leather kilt? Leather boots. But the analysis doesn’t end there. I mean, cowboy boots? Italian hikers? Motorcycle harness boots? Naw, none of those seem quite right. They all look too clunky with bare legs. The right needs to go several inches up the leg, and hug your calves tight. In my collection, that leaves two potential solutions. 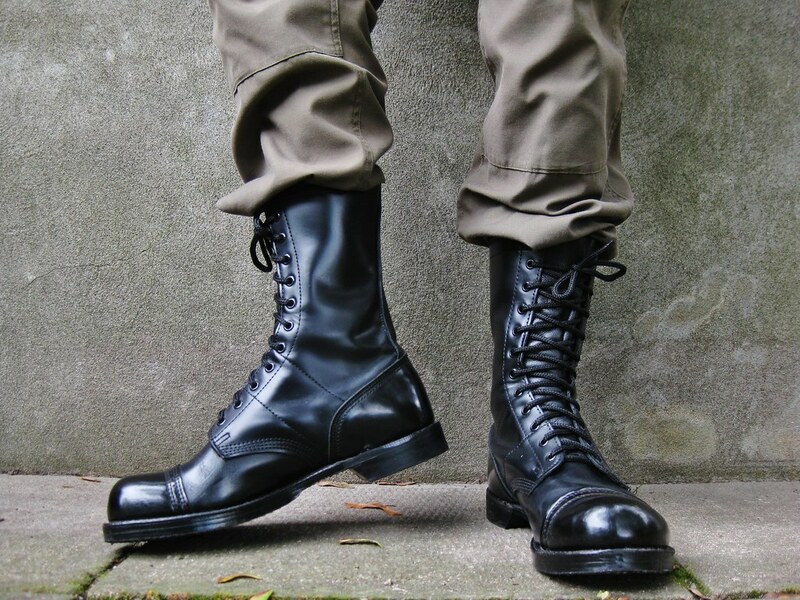 I’ve got the Chippewa Station Boots (see them here, courtesy of Booted Harleydude). These are the ones I wore on Sunday around the festival. They’re maybe my favorite pair of boots of all, and they worked pretty well. In fact, the kilt lets me show off the boots better than jeans do. Win-win(-win)! It seems like a good category in general for my needs would be combat boots. My combat boots are a pair of original Corcoran Jump Boots. They lace up tight around the leg and spit shine up quite nicely (like this). Actually, that’s a good start. Of course, I can’t let this opportunity to get another pair of boots go to waste. So . . . maybe something like this?